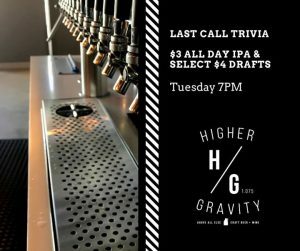 Every Tuesday we have Last Call Trivia in the house. Prizes awarded to 1st, 2nd and 3rd place teams. 7-9 PM every Tuesday. We will have $3 All Day IPAs and select $4 drafts. Bring your own food.